It may not feel like spring where you live, but here in Texas, we've had a mild winter and the trees are already budding out. Not being a fan of cold weather, I really welcome the warmer days, more light and feeling energized after the winter. If the weather is still winter where you are, hang in there! Spring IS just around the bend. I've noticed a tendency (by looking at my checkbook register). It's not pretty, but it's a fact. In the winter I get bored. There is less to do and see and I can't stand to be outside in cold weather. When it's cold, I tend to shop more (online anyway). I believe we all can relate to emotional spending. I've included a great article on emotional spending I believe everyone will benefit from as much as I did. Resolutions: Crossing Over Into the "New"
Winter 2005 was bleak and dreary. I was single, new to a large city and occupying a sad excuse for an efficiency apartment. Christmas was nearing, and "retail therapy" wasn't curing my solo holiday blues. It was, however, consuming the remainder of my credit limit. My Christmas spending couldn't fill my loneliness, of course, but I hoped the momentary thrill of buying things would satiate my deeper longing to be married. But immunity from the temptation of emotional spending doesn't accompany marriage. Communication problems and unmet emotional needs that occasionally burden all marriages can leave us vulnerable to the lure of things. The good news? Emotional spending is avoidable with a little common sense, communication and contemplation -- all free and readily available. There's nothing wrong with enjoying the resources we've been blessed with as long as we're debt-free, tithing and acting generously toward those who are less fortunate. But an epidemic of overindulgence has pillaged the personal finances of Americans. According to the Center for American Progress, household debt averaged 133.7 percent of disposable income in late 2007, a record high. With savings at the lowest level since the Great Depression, many consumers are relying on credit cards to pay essentials such as medical bills, car repairs and rent. Experts recommend redirect spending urges into activities (such as date night with your spouse) that may meet the underlying need. I also find it helpful to pray for wisdom before I enter a store. "Tank up" before you head out. It's not a good idea to grocery shop on an empty stomach; it's even a worse idea to do shopping of any kind on an empty heart. If possible, spend some quality time with your spouse before heading out. Discuss recent stressors and desires. Better yet, bring your spouse with you and keep each other in check. Self-audit often. Make a shopping list. If an item not on your list ends up in your cart, ask yourself, Why am I buying this? If you can't come up with a sensible answer, you probably need to put the item back. Be sure to scan your cart again before checking out. Ask yourself if you can do better. Is there a less expensive version of the item you just chose? It might not be as attractive, but you'll leave the store with more money in your wallet. Describe the product in your own words. The shampoo says it's "degunkifying," a "fusion" of "icy pineapple" with a special "tingling potion." Really? Or is it room-temperature, pineapple-scented shampoo? Look for a product of similar quality with a cheaper price. Get the real thing. Ask yourself, What am I really trying to buy? Will a cart full of binders, day planners and gel pens really help you become more organized, or do you just need to become more disciplined using the supplies you have at home? Do you really need to shell out a small fortune for the latest mineral makeup, or would telling your husband you'd like more attention serve the same purpose? The real answer is often cheaper, more effective and more fulfilling. Carefully consider if you're looking to retail therapy for deeper answers. Are you shopping with your head -- or shopping with your heart? Erin Prater, her husband and her vast coupon collection live in Pueblo, Colo.
New Year Resolutions 2 -- Tips for Crossing the Board Into the New Year. 1. Be You. This may seem simplistic and unnecessary. But, we live in an age of such relentless conforming pressures, that too many people borrow their actions and attitudes from others. For example, if our own social network is intensely materialistic, then we feel pressed into compliance with externally-defined objectives ("You know, honey, we need to update our kitchen this year," or "With the kids growing up, we really should invest in a new minivan . . . "). 2. Think large. I believe the best New Year's resolutions spring out of a large and long view of life. What really matters to you? How do you see your legacy? Do you have a sense of calling? If so, what are you called to do? It is always better (and easier) to work within the large scope of God's call and blessing than to operate outside it. 3. Focus on details. Once you have a large view of God's call and favor on your life, you can work out the details. In other words, you can move from the "macro" of the large canvas to the "micro" of particulars. Identifying the large themes of your life will always help to move into wise and realistic details. 4. Be specific and brief. "Improve my health" is not a good resolution. "Lose 1 pound per week" is a good one (don't think that is too small; how many people lose 50 pounds per year?). Resolutions must be simple, clear, realistic, and limited if they are to have any chance for fulfillment. 5. Pray over the list. This is the most important step. Let me tell you why. Ed Chinn is an organization consultant and free lance writer from Fort Worth, Texas (edchinn@charter.net). His work has appeared in the Christian Science Monitor, The Washington Post, Opinion Journal.com and the Fort Worth Star Telegram. ToteTrac is a storage rack system that holds a variety of plastic storage totes of all sizes and shapes. It mounts to the joists or rafters of your ceiling in your garage or any room in your home. It can also be mounted to walls for side storage. ToteTrac holds the totes from the handle, rim or lip of the totes. Unlike other complex storage systems, ToteTrac was designed with minimal parts for ease of installation. Each ToteTrac pack comes with all the hardware you'll need to install. Each individual Trac comes with 2 brackets and 2 bolts. In addition, each package comes with a variety of hangers for bicycles, ladders or whatever you may need to hang. Q. How much stuff can the ToteTracs hold? A. Each Set of ToteTracs can hold up to 400 lbs and the Tracs are easily expandable to add on as many Tracs as needed. Q. How easy is it for one person to install the ToteTrac? A. The ToteTrac is extremely easy to install for one person. All it takes is 2 screws and you’re ready to start storing! Q. Can the ToteTrac be installed on a Drywall ceiling? A. Yes, the ToteTrac can be installed in A finished (drywalled) ceiling, or an unfinished ceiling. The screws supplied are long enough and built to go through drywall. Q. Will my garage door be able to clear the ToteTracs? A. Yes, the ToteTracs are designed to fit over a garage door. The amazing thing about ToteTracs are that they can fit any size totes! Q. Can I buy the ToteTrac at the local store? A. No, the only place to purchase ToteTrac is on their website or by calling (714) 668-3004. Q. How many ToteTrac sets can I install in my garage? A. 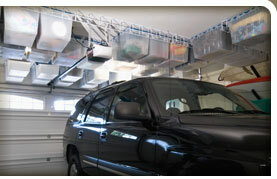 Depending on the size of the garage, the ToteTracs can be used to fill the entire ceiling of the garage. A standard 1 car garage is 200 square feet, and the Collectors Pack holds 22 Totes at 55 square feet. Q. What do I do if I am having trouble installing my ToteTrac System? A. First, you should go to the website and download the instruction. For additional assistance, call (714) 668-3004 for customer service. Q. What are some suggested uses for ToteTracs? A. ToteTracs are used to store bins, containers or totes. From the ToteTrac system you can hang bicycles, surfboards, sports bags, or any other item with a handle. Q. How do I hang other stuff from my ToteTrac System? A. Skis, Snowboards, Surfboards, luggage, etc. can easily be hung in between the Tracs. All you need to do is hook up 2 bungee cords between the Tracs and let them hang. You can also use the hooks supplied to hang additional clutter. Q. What type of accessories do you suggest for my ToteTracs? A. ToteTrac, Inc. supplies you with Bike Hooks, Ladder Hooks, and Utility Hooks, but if those do not hold everything you need, we recommend Bungee Cords and Carabineers. Q. Can I use bins or containers that I already have? A. Yes, just make sure that they fit the compatible tote description located on the Compatible Totes Tab. Q. How can ToteTracs be installed on the wall? A. ToteTracs easily work on walls. All you need to do is refer to the instructions and apply them to your wall joists. Units are reasonably priced from $59 to $89. I hope you enjoyed the March 2009 issue of Messy Makeover Magazine. I consider it a privilege that you took your valuable time to subscribe and read this magazine.